As the bank holiday weekend dawned bright and sunny on Saturday it was clear to all that the cross-country season was over. The heat was on: it was time for OUCCC to turn its attention to the track and show that we have our share of track athletes mixed in amongst the ‘slow-twitch monsters’ the club is famous for. The first distance event of the weekend was the men’s 1500m heats which saw three Oxford athletes take to the track in three out of the five heats. The top four in each heat plus the next four fastest times across all heats progressed to the semis, an incredibly difficult task in a stacked field with many high pedigree athletes. First up was Miles Weatherseed who had the disadvantage of being in the first heat which tends to yield the fewest fastest losers. He set off well, leading the pack for the first 800m and setting an honest pace, however, unfortunately didn’t quite have enough over the last 400m, narrowly missing out on a qualifying spot much to his frustration. Next up was Luke Cotter, in heat 4, who after a long time out with injury moved back up to the 1500m after placing second in the 800m at cuppers. He raced well, clocking a sub-4 minute time and again narrowly missing out on a spot in the semis. Last up was Alex Gruen, in heat 5, who made his automatic qualification intentions clear from the start and tucking in in second place. He was quite the favourite of the Vinco livestream commentator who spent the majority of the race likening him to an 80s footballer due to the head band and split shorts he was wearing. Gruen finished a comfortable second in his heat, easing down over the line to take his automatic place in the semi finals. Next up, it was turn of the women to take on the metric mile, with Charlotte Dannatt and Eleanor Bolton flying the flag for Oxford. Charlotte cruised through her heat in 4.41, looking untroubled in her first outing on the track at university. Eleanor ran strongly in third and final heat but didn’t progress in a strong field. In the Women’s 800 heats Oxford had only one runner, Natalie Beadle, but what we lacked in quantity we madeup for in quality with Beadle finishing 6th in her competitive heat in a time not too faroff her personal best. The Men’s 800m was up next, again with another stacked field with 10 men having run 1.50 or under. Heat 1 saw Charlie Sneddon finish 5th, clocking a comfortable sub-2 time but this sadly wasn’t enough to see him progress. It was another 5th place finish for Bonnor O’Sullivan in heat 5 which again, sadly meant he missed out on the semi finals. It seemed strange having heats in the Men’s 3000m steeplechase as it’s only purpose was to remove 3 members of the field – luckily this didn’t include Oxford’s Kirk Smith and Miles Chandler who both ran solid races over the barriers to qualify for the final on the Monday. Sunday saw the temperature rise further making for uncomfortable conditions for distance running, however, this didn’t stop Gruen achieving another 2nd place finish in a nail-biting semi final. He ran just outside of his PB in a race that was initially pedestrian with a massive final 800m coming in 1.57. This saw a large pack sprinting down the home straight to try and achieve one of the five automatic qualification spots on offer but luckily Gruen used his signature kick, made famous in the DMR at FEAR where he secured the win for Oxford, to secure his spot in the final the following day. Charlotte Dannatt also had a busy Sunday. She was agonisingly close to making the final, finishing one place below what was needed for qualification, but setting a new 3-second PB, which is very encouraging so early in the season. Not satisfied with two races in two days, she raced in the 4×400, helping the Oxford team to the final and writing her name into the record books as part of the 4th fastest Oxford Women’s 4×400 in history. The Men’s 5000m races commenced the action on the final day of competition. Two races were run to cope with the large number of entries and final places allocated based upon the times run by athletes in both races. Oxford had two athletes in the competitive B race, Jack Millar and the returning Miles Weatherseed. Both ran solid races over the twelve-and-a-half laps, a task made more difficult by the rising temperature. Millar finished in 4th place and Weatherseed in 14th. In the gruelling A race Jamie Parkinson, the recent Oxford 2km steeplechase record holder, took to the track finishing in 15th place. A few hours later the dynamic Oxford 5km duo of Kim Horner and Flo Scrafton took to the track. Kim was up first running in the B race which saw an Oxbridge breakaway in the latter stages. Kim battled hard and was rewarded with an impressive 2nd place and a new PB that was comfortably beneath the Full Blue time. 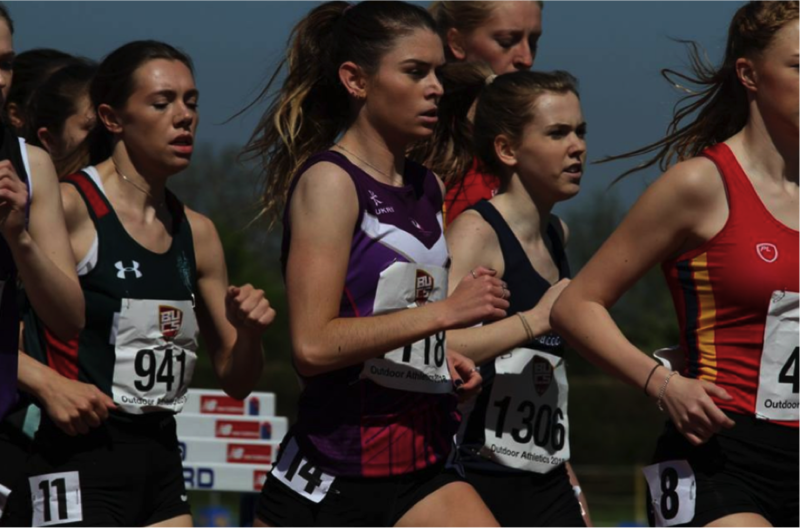 She also comfortably beat one of the Cambridge runners, which bodes well for the fast approaching Varsity match on 19th May at the Iffley Road Track. Flo then took to the track in a high calibre A race, which included two athletes who had recently returned from the Commonwealth Games in Australia. She battled hard in a difficult race finishing 12th in the stacked field. 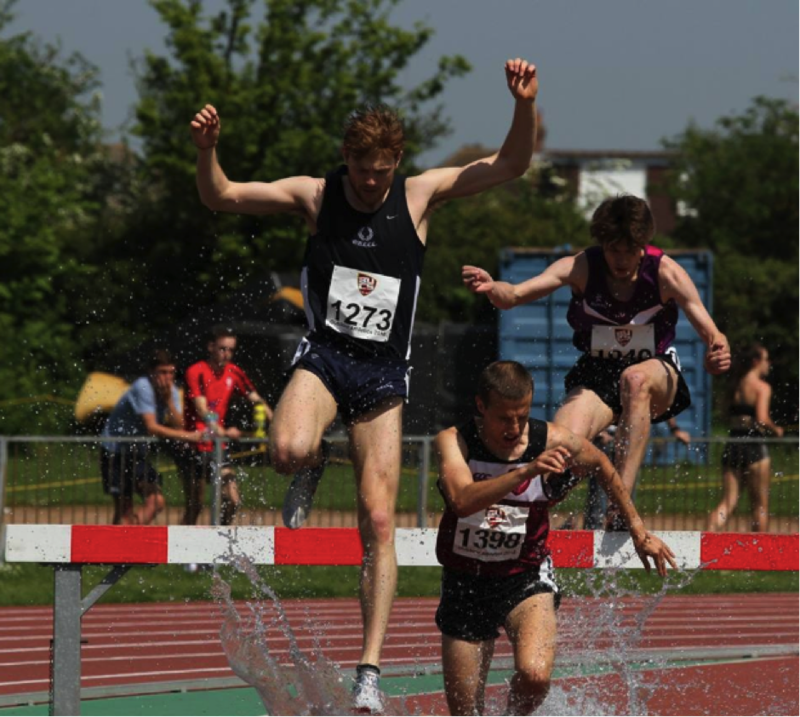 In the final of the Men’s Steeplechase Smith and Chandler appeared to have recovered well after the heats on Saturday, finishing 9th and 7th respectively and running far faster than they did to qualify. Oxford had two athletes of interest in the Women’s 2km Steeplechase. BUCS indoors 1500m silver medallist Dani Chattenton demonstrated her class with an impressive 4th place finish and comfortable Blues time, whilst Anna Sharp also rose to the occasion, smashing her PB by around 20 seconds and running her first Full Blue time, an amazing feat in such tough conditions. The last distance event of the day with Oxford interest was the Men’s 1500m which saw Alex Gruen return to the track for the 3rd day in a row – a highly difficult and exhausting task, especially after such a competitive semi final the previous day. He finished in 10th place, an impressive achievement after so many consecutive days of high level competition in the heat and in a field boasting many international athletes. All in all, it was a successful weekend for OUCCC, but we know we’ll have to raise our game again in order to succeed in our home Varsity match in a little under two weeks. Oxford PhD student Eoghan Totten finished tenth in the 2018 London Marathon on Sunday, running the non-elite race in a time of two hours and 26 minutes. One of over 40,000 runners completing the field, Totten will be the first Oxford athlete to earn a full blue in marathon. He completed the race, which was also his marathon debut, within the full blue standard time of two hours 30 minutes. Earlier this year, Totten represented Northern Ireland in the Antrim International Cross Country. Speaking about his debut, Totten told Cherwell: “I learned that you must respect the distance and that factors at variance with other, shorter distances, come into play over 26.2. 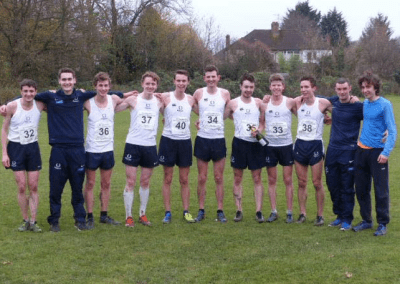 The marathon varsity match was won by the Oxford men’s team, however the Cambridge Hare and Hounds won the women’s match, bringing OUCCC’s varsity record this year to seven wins out of nine matches. Katie Truslove, a junior dean at St Hilda’s College, led the Oxford women’s team, finishing in just under three and a half hours. Rahil Sachak-Patwa was the second Oxford finisher with a time of two hours and 41 minutes, which falls within the half-blue standard and beats his personal best by one second. This is an improvement on last year, when Rahil collapsed during the closing stages of the marathon. Eliud Kipchoge, who visited the Oxford Union for a talk about his marathon successes in Michaelmas, won the men’s marathon with a healthy lead, in a time of two hours and four minutes. Vivian Cheruiyot, the 2016 Olympic 5000m champion, won her first London Marathon in the women’s race. The marathon was the hottest on record, reaching a top of 24˚C. In related news, Alexander Betts, a professor of Forced Migration and International Affairs and fellow at Green Templeton College, completed the 2018 Boston Marathon earlier this month. In doing so, Betts set the world record for running the six Abbott World Marathon Majors in the fastest combined time, averaging at two hours 41 minutes. As always, the day of the Varsity Match began with its own set of unique formalities after the teams disembarked at Wimbledon Common. However, after the photos, the blues blazers and carnations were swapped for running kit and a nervous sense of anticipation, which would build over the following hours .The first race for the day was the 26th Old Blues’ Race. Despite some strong individual runs from past and present Oxford students, Cambridge’s superior numbers helped them take the match victory. With most of the competitors in the Old Blues’ Race now lining the course, all attention turned to the 42nd Ladies’ Race. Many thought that the Oxford team was one of the strongest in years, but with four fresh faces all in their first year at Oxford, it remained to be seen how they would perform in a high stakes Varsity Match. However, there was no reason to fear, as the Oxford girls dominated the race from start to finish, with Floren Scrafton storming home over the final kilometres to take a comfortable victory, followed by Sophia Saller who finished in a well-deserved third place, and Charlotte Dannatt, who came in fourth – an amazing performance as a fresher. Kim Horner and Dani Chattenton rounded out the Oxford scoring, coming in 7th and 8th respectively, and Connie Hurton and Hannah Plaschkes completed a fantastic day for the Oxford women, both beating in the last Cambridge scorer to finish in 10th and 11th place respectively and seal a 23-34 victory for Oxford. 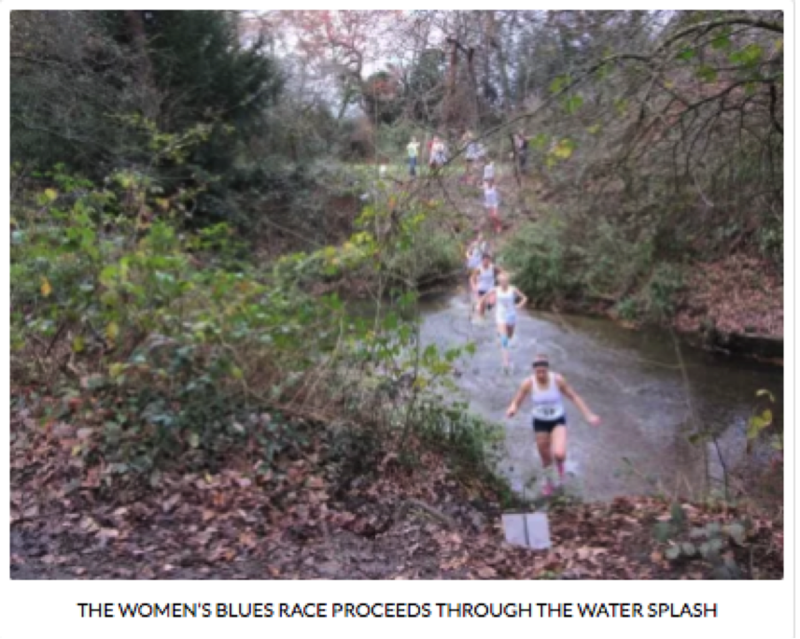 There was jubilation and celebrations for the Oxford women before attention again returned to the course for the 127th Gentlemen’s Race. The Gentlemen’s race is usually a battle of patience and attrition over the gruelling 7½ mile course, but Cambridge seemed to make a concerted effort to push the pace along after the water jump in the first few miles. However, any marginal early advantage they may have gained was neutralised when they needed some of Jamie Parkinson’s orienteering experience to make sure they continued on the right path. As the race wore on it became clear that it would be an incredibly tight race with just a couple of runners swapping position enough to hand the advantage to either team at any given point in the race. In the second half of the race, a series of groups emerged, and it became evident that whichever team could win more head-to-head battles within these groups would be the overall winners. The front four was one such group, consisting of Jamie Parkinson and Will Christofi from Oxford, and George Gathercole and 2016 Varsity winner Ollie Fox from Cambridge. The race was too close to call right into the last few hundred metres until Jamie put down a withering burst of speed to take the individual victory ahead of the two Cambridge runners. Christofi was next in, very close behind in 4th, and he was followed in by a pack of Oxford runners: Jack Millar, Dan Mulryan and Luke Metselaar who took 6th, 7th and 8th respectively. Olly Paulin from Oxford was locked in a key battle with Phil Crout for much of the match, but with some help from a stray tree root Paulin edged out the Cambridge runner to finish in a strong 11th in his first Blues match. Three Cambridge runners were next in, followed by Alex Bampton and Kirk Smith in 15th and 16th respectively. There was tension directly following the finish, as nobody was completely sure who’d won, but the Oxford Blues were ecstatic when the final result: Oxford 37 – Cambridge 41 was announced a few minutes later. This was especially exciting as it represented the first time since 2010 that both Oxford teams were victorious in the Blues Varsity Match. Great credit must also go to both Cambridge teams who ran very strongly on the day, contributing to one of the strongest days of Varsity competition in many years. Overall, it was a great day for OUCCC, completing a marvellous term where Oxford also won the II’s – IV’s Varsity Match 4-1. None of this would’ve been possible without our fantastic and dedicated coach Kyle, who puts in hours of work every week, and our committee who put a significant amount of time and effort into organising the club so everything goes smoothly. Of course, the continuing support from Neptune has also been a driving factor in the club’s sustained success. It has helped us run the strength and conditioning sessions and travel to races among many other things necessary to keep the club healthy, and we would like to extend our thanks to Neptune.